Wild and wonderful, this beautifully restored bergerie encompasses everything you will remember and love about Corsica. 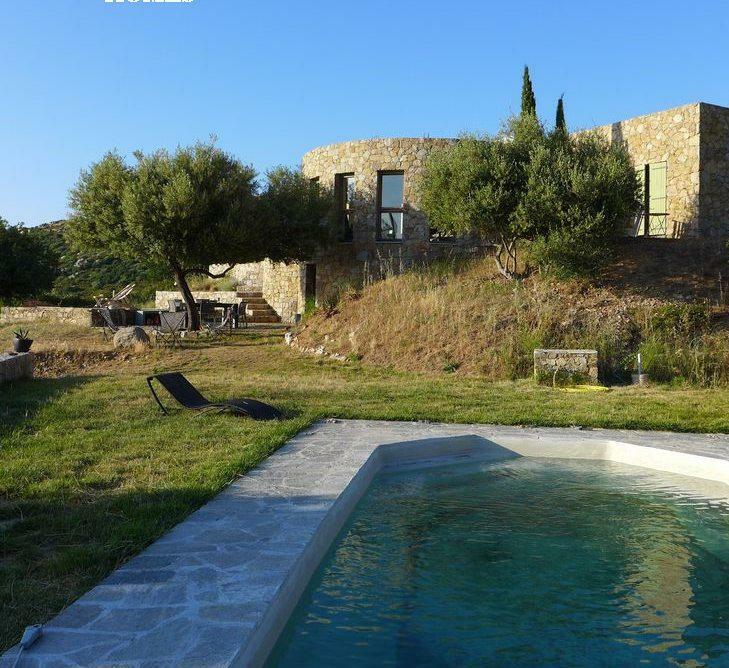 Five minutes to nearby village of Lumio and close to Calvi town. Good-sized private pool. Stunning views of sea and mountains. Just 2km to the beach. 4 bedrooms, to sleep 10 people. NB: No WiFi in this property. Nestled in the famous Corsican scrub, backed by mountains and offering stunning panoramic sea views, this beautifully restored bergerie is everything we remember and love about Corsica. Located on a private game reserve down a rather tricky dirt road (but worth it! ), it’s a peaceful and perfect haven on the Isle of Beauty. Constructed of traditional stone and limestone, it has all of its history and charm intact with some stylish new finishes and detail. The main living area overlooks the pool (10m x 4m) and gardens and is a cozy fireside place to gather with a cool selection of personal and handpicked furnishings and decor. The fully equipped eat-in kitchen can serve up to four inside or better yet poolside with garden and ocean views. The four bedrooms can accommodate up to ten and it’s a perfect family friendly retreat away from it all. The house is located in La Balagne, an area of Corsica famed for its local food products. The picturesque and charming village of Lumio is just down the road. To the north you’ll find a wonderful and wild beach of l’Ostréiccone and further south, is the “Calanches de Piana” with incredible red rock formations above the sea for exploring. Be sure to take the drive along “Route des Artisans“, which crosses through several charming Corsican villages like Pigna, Corbara and San Antonino. Le Clos Colombu the famous “wine cave” of Lumio offers a great look at the wine-making process and offers delicious tastings. Nearby Calvi is a bustling town with great cafes and shops and its beautiful and historic citadel. The house does not have wifi. TV with DVD player and video library, stereo and iPod audio system, books. Housekeeping extra, laundry facilities.